On 21 Jan 2017, the White House called a press conference where the press secretary accused the media of "deliberately false reporting" on two issues of which the number of people attending President Trump's inauguration was one. The white floor covering on the National Mall on the day of the inauguration was one of the pieces of evidence which the press secretary used to support his assertion that Trump's inauguration had a greater attendance than the previous inauguration and that the media was deliberately misleading the public by reporting otherwise. Was President Trump's inauguration "the first time ... that floor coverings have been used to protect the grass on the Mall"? No, it was not the first time they were used. 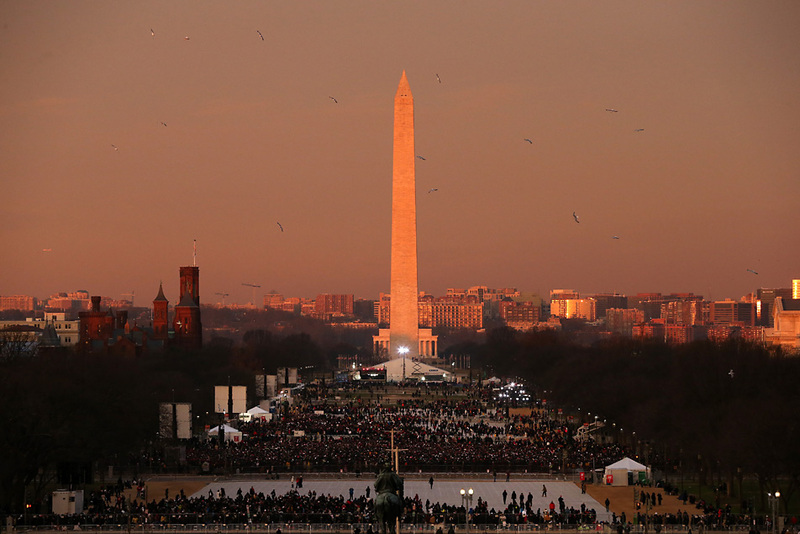 Such protective coverings were also used at the 2013 inauguration. With just four days to go before the Inauguration, caretakers of the National Mall are rushing to preserve the grass. Huge crowds four years ago virtually destroyed the grounds. Starting Friday morning, crews will put down thousands of plastic sheets over six-and-a-half acres of new grass on the Mall. The terraplas, as it's called, sits inches above the grass, allowing light and water to pass through. This multi-million dollar project will take two days to complete. In 2017, terraflor coverings were used for the first time. Terrafloor coverings are not the same as plastic sheets. A much larger area of 18.3 acres (= 7.4 hectares = 800,000 sq feet) of grass was covered. So, Sean Spicer was right when he said floor coverings were used for the first time. The floor coverings look white in the images. Much more space was highlighted in 2017 than was in 2013 which would make it more noticeable if the crowd was scant in those areas. Was Truman told that the first atom bomb was going to be used on a military target? Has Steve Bannon expressed anti-semitic or racist views?